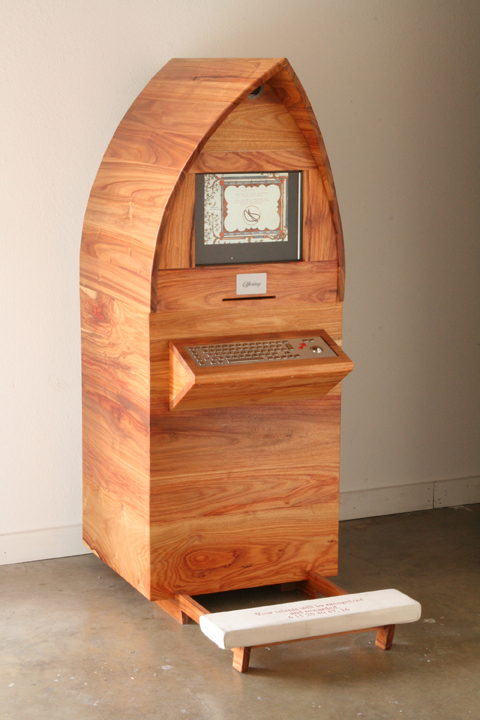 Ordination Kiosk. Participants can become ordained and print ordination certificate. I do not know what I may appear to the world, but to myself I seem to have been only like a child playing on the seashore, diverting myself in finding a smoother pebble or a prettier shell than ordinary, whilst the great ocean of truth lay all undiscovered before me. Much of my work revolves around questions of what we believe as individuals and as a society, why we surrender authority to leaders, and why so many of us never stop to consider these questions. When I was in seventh grade I wanted to become an Episcopal priest, and never really considered other options. As a young adult I started the process of entering the priesthood, and had to complete an essay addressing the main question – why? Up to that point, I hadn’t really asked myself that question. I realized I couldn’t answer it and finally began to question my religious faith. The result was a lovely and bizarre epiphany not only that I couldn’t become a priest, but that I couldn’t go to church at all. As an artist, I realized that epiphany lies in the act of exploration and in the ordinary world around us. My work is not a criticism of organized religion. Rather, it is a celebration of the things about the church that I love and miss: the pageantry, the architecture, the community, and the music. These elements of ritual in organized religion served as fuel for my youthful imagination, and much of my work employs quasi-religious ceremony or imagery as a way to encourage questioning, exploration, and celebration of all aspects of our existence. As a child, church activities were like play to me. As an artist, my playful tendencies arise in material exploration. My video portrait series of elderly friends began when I realized how mesmerized I had become of old, wrinkled skin. I have a series of vacuform sculptures that I continue to play with because I love the process. There is an element of chance in the creation and the forms tend to reveal new and exciting views of the original form. I love to play in the digital realm and I enjoy finding ways to marry the digital with sculptural elements because I love getting my hands dirty and I enjoy the tangible, tactile results. By sharing a playful attitude of exploration and questioning, I hope to provide reminders of the beauty around us, the wonderful quirkiness of our world, and to create for the viewer a moment, however brief, to pause, wonder, question and participate.